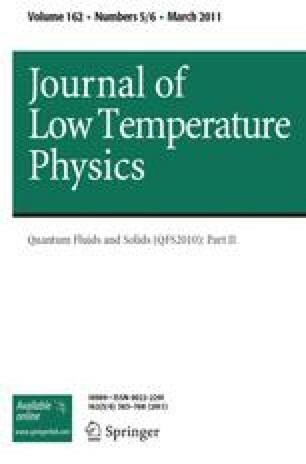 The low temperature specific heat of the colossal magnetoresistance compounds (Nd x Y1−x )2/3Ca1/3MnO3 (x=0, 0.1) for 0.4≤T<2 K in magnetic fields up to H=9 T has been studied. Applied magnetic fields lead to the drop of the low temperature specific heat by more than 2 orders, which implies a large magnetic contribution. Experimental data were successfully fitted by the sum of the hyperfine C hyp , the linear T-dependent C sg and the spin waves C sw contributions. The C sg attributed to the glassy state of the magnetic systems of the studied insulating compounds exponentially decreases with the increase of H up to ∼5 T. The C sw providing the best fitting of the experimental data is attributed to the ferromagnetic spin waves with pseudo gap Δ(H) in the spin–wave spectrum which increases linearly with the increase of the applied magnetic field. The Δ(0)∼0.8 K is approximately the same for both compounds studied.